The Audio Surveillance Recorder accommodates GSM Bugs that broadcast their captured conversations over the phone. Boasting 265 hours of surveillance storage, the Audio Surveillance Recorder connects to a single line phone and remains dormant and uses almost no energy until you connect your phone call to receive the audio surveillance from the GSM Bug. The recorder starts recording once it hears sound, thanks to the voice recorders voice activation feature. 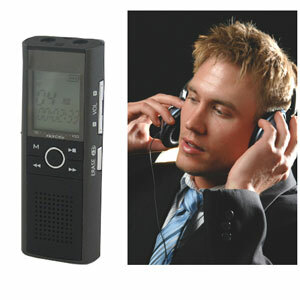 The Audio Surveillance Recorder activates when you lift your telephone receiver and deactivates when you hang up. Running on batteries alone, the system can record 20 hours on "AA" batteries. After 20 hours, simply replace the batteries to continue recording. The audio recorder also operates as a room recording system, and comes with a microphone for room surveillance. With a microphone input jack, you can connect your Surveillance Receiver to the Audio Surveillance Recorder and save conversations you pick up from the Surveillance Receiver. Features include: "vibration" record indication, recovery of erased file system, and time/date stamping. Full accessories such as a cell phone recording adaptor and AC Adaptor for 110 Volt usage are inclluded.